Has Joseph’s Tomb Been Found in Egypt? This article appeared originally in the June and July 1999 Levitt Letters. Part 1 — this article first appeared in the June 1999 Levitt Letter. Is it possible that the tomb of the ancient patriarch Joseph has been found in Egypt? The Biblical account is that Joseph was elevated to being the right-hand man of Pharaoh, the vizier of Egypt, because God enabled him to interpret Pharaoh’s troubling dream. Joseph then structured the agriculture and taxation procedures of Egypt so that great storehouses of grain were utilized over the seven good years, with the result that there would be an abundance of food during the seven bad years. When the bad years came, there was a famine in Canaan, and Joseph’s estranged brothers and his father Jacob made their way to bountiful Egypt, where they discovered to their great surprise that the despised brother was not only still alive, but both able and willing to save them and provide for them. Through Joseph’s good offices, Pharaoh allowed the Hebrew cattlemen from Canaan to settle in the Land of Goshen, in the eastern sector of the Nile delta. This land was relatively flat and well watered from the flow of the delta. For several hundred years, from Joseph to Moses, the Hebrew people flourished and multiplied in the Land of Goshen, even after a Pharaoh arose “who knew not Joseph,” and all he had done for Egypt. Thus the story of the bones of Joseph is faithfully recorded by Moses and Joshua, to make sure that posterity knew that the oath Joseph made his fellow Israelites swear had been fulfilled to the letter. Joseph’s body did not remain in Egypt, but went with his people and abode with them in the Land of Israel. Joseph is a magnificent illustration of the Messiah, the rejected Kinsman Redeemer who will ultimately be reconciled with His Jewish brethren in the Land of Israel. But we return to Joseph’s coffin in Egypt, where his bones lay for hundreds of years. It must have been well marked and identified all that time, in order for Moses to have selected it out of all the Hebrew tombs in the Land of Goshen. Most likely, the coffin of Joseph would have been laid in a clearly identified tomb, befitting the office of the man who had served most of his life as the vizier of all Egypt. Furthermore, Joseph would have wanted his tomb to be in the Land of Goshen, close to his people, where his remains would be readily available when the people of Israel left Egypt. Also, we would not expect Joseph, as a Hebrew, to be buried in the Upper Nile Valley, known as the Valley of the Kings. This is where the Pharaohs and some of their chief servants were buried. It was probably by mutual agreement that Joseph, although the vizier of Egypt, would be buried close to his people in the Land of Goshen. Such is the Biblical account of the burial of Joseph. Does archaeology confirm any of this? Up until recently, it has not. The Egyptian archaeologists, using the conventional chronology, have not been able to find any evidence of the Hebrew people in the Land of Goshen as indicated in the Scriptures. They do find various groups of Semitic people occupying Goshen at various periods of time, but they do not see any mass Semitic occupation at the time the Exodus was supposed to occur. In their chronology, if the Exodus event occurred at all, it would have had to have been about 1300 BC. Only traces of Semitic occupation are found at that time period. This has led the archaeologists to conclude that the Exodus never happened. They think that Moses and his phenomenal struggles with Pharaoh are all mythological and unhistorical, and only a “fundamentalist conservative” could possibly believe in the historicity of these ancient Biblical accounts. Part 2 — this article first appeared in the July 1999 Levitt Letter. It is important to understand that the Biblical chronology does not put the Exodus at 1300 BC, but rather some 150 years before that, around 1450 BC. What a difference a couple of hundred years make! At that time period, there is evidence of a massive Semitic occupation of Goshen. Until recently, though, Egyptologists have claimed that this could not be the Hebrew occupation described in the Scriptures, because it is too early. They ascribe this occupation to other type Semites, such as the Hittites. 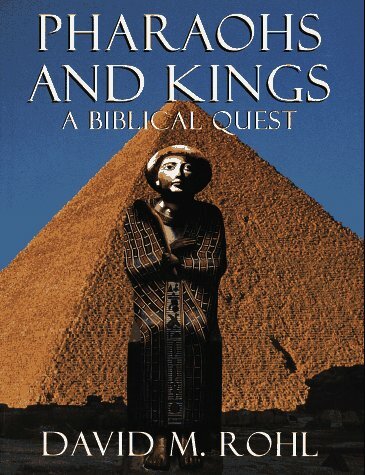 However, there is a small but very vocal group of Egyptologists, led by British scholar David Rohl (author of Pharaohs and Kings ), that is vehemently challenging the conventional chronology. They assert that there are numerous fallacies in the assumptions of the accepted chronology, and they have established a new chronology based on what they believe are more sound Egyptian archaeological grounds. Having done this, these secular scientists were astonished to discover that the new chronology supports the Biblical chronology, and the once mute Egyptian evidence is alive with testimony to the validity of Biblical history. One case in point is the historicity of Joseph. By looking for Hebrew occupation in the several hundred years before 1450 BC (instead of around 1300 BC), there is much evidence. There are large peasant-type cities in Goshen, with a Semitic culture obviously different from that of their Egyptian hosts. There are also some mass graves with numerous bodies, very unusual in Egypt, indicating some kind of plague that struck the land, as indicated in the Book of Exodus. In the upper Nile River, where the water flows between high cliffs, there are markings by the Pharaohs of the high levels of the river. There are several years in a row in this early time frame, when the level was marked as extremely high. This would cause excessive flooding along the Nile, making it impossible to plant crops until it was too late for the growing season, ruining the harvest. The new breed of Egyptologists thinks that the seven bad years in Egypt in Joseph’s time were caused by this type of flooding action, rather than by a lengthy drought. There is other evidence of Joseph in Egypt during this time period. An artificial lake was made in ancient times called Lake Moeris. It was formed by a canal running off the Nile River called to this day the Canal of Joseph. Beside the lake, which still exists (although smaller in size), there are ruins of a massive building, which contained a labyrinth, and was considered one of the greatest structures of its time by the Greek historian/traveler, Herodotus. The building had twelve sections (reminiscent of the twelve tribes), and might well have been an administrative headquarters for Joseph’s agricultural program. The Pharaoh of the time was obviously very proud of the lake and the massive building, because he built his own pyramid at the site for his burial. Nothing like this complex exists anywhere else in the vast ruins of ancient Egypt. Again, the new Egyptologists suggest that this complex is stunning evidence for a remarkable foreign assistant to Pharaoh, and occurs in the correct time frame for Joseph. One last stunning piece of evidence for Joseph exists, and that brings us back to his burial in Goshen, and his bones that were removed by Moses at the time of the Exodus. In this same area in Goshen, where a large contingent of Semites lived, a great palace has been discovered, with a garden and a tomb, curious in its combination of Egyptian and Semitic styles. Rohl and his colleagues believe the palace is that of Joseph, perhaps his retirement villa after many years of service to Pharaoh. It has two apartments in front, suggesting the living quarters of his sons, Ephraim and Manasseh. In the rear are the more spacious living quarters of the prime occupants, perhaps Joseph and his Egyptian wife. Adjacent to the ruins of the palace, there is an elegant garden area, and in the garden was an unusual tomb. The tomb was in the shape of a small pyramid, but it is clear that the vault was broken into and the remains removed. However, the damage to the tomb was not like that done by the all too common grave robbers of Egypt. It appears to be a careful and methodical removal of bricks from the tomb, as one would expect where the bones of Joseph were carefully removed from his long-used grave by Moses. Could it be that we have here the very tomb of the great patriarch Joseph? The evidence certainly takes it out of the realm of mythology, even for the hardened scientist, and into the realm of accurate history. But there is more. In the tomb complex, there are ruins of an ancient statue, also unusual in its design and subject matter. It has been violently smashed almost beyond recognition, but enough of it has been found to piece together a possible identification. The statue is of a man who had obvious stature in the Egyptian power structure, with the symbol of Pharaoh’s authority, the throw-stick, on his chest. Yet he also has an unusual Semitic hairdo, with flaming red hair, and wears a coat with variegated colors. The statue has been deliberately smashed and defaced, with an obvious attempt to destroy the head and face. It is as though the remaining Egyptians were so angry with the Semitic inhabitants that, when the Semites left, the Egyptians tried to destroy any trace of their occupation. One could well imagine this to be the reaction of the Egyptians after suffering the plagues and the Red Sea destruction at the hand of the Hebrews and their mighty God. The similarities between this ruined statue with the Biblical account of Joseph are so striking, that Rohl has an artist’s conception of what this statue might have looked like on the front cover of his book. The new Egyptologists are persuaded that they have not only corrected some of the most glaring errors in understanding the history of ancient Egypt, but that they have constructed a marvelous bridge between the histories of Egypt and Israel that demand further study and appreciation. Not least in this consideration is the possibility that the artifacts of the unique person of Joseph have been discovered in the stone ruins of Egyptian archaeology. Copyright © 1999 Zola Levitt Ministries, Inc., a non-profit 501(c)(3) organization. All rights reserved. Brief passages may be quoted in reviews or other article. For all other use, please get our written approval.